On Friday, Alembic, India’s oldest pharmaceutical company announced its entry in real estate sector as it has launched a company called Alchemy Real Estate. The CEO of this company will be Mr. Udit Amin, son of chairman and managing director of Alembic Limited Chirayu Amin. The city-based pharmaceutical major Alembic had announced its planning in June this year about entering the realty sector with residential and commercial properties. Also, one of the official told that Shangri-La, company’s first residential project is located on Alembic road overlooking Alembic cricket ground and near Bhailal Amin hospital. During these announcements, officials informed that the company holds more than 100 acres of land in the city out of which around 50 acres is might be used for real estate purpose. The recently launched residential project will consist of 11 towers of nine floors. There will be in all 396 flats of two, three and four BHK. 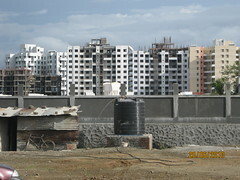 The project is spread over six acres of land. This entry was written by , posted on August 15, 2010 at 10:49 am, filed under Property News and tagged Alchemy, Alembic Limited, Bhk, India, Pharmaceutical Company, Real Estate Sector, Residential Project, Shangri La. Bookmark the permalink. Follow any comments here with the RSS feed for this post. Trackbacks are closed, but you can post a comment.